Athenahealth shares recover some losses after CNBC's David Faber reported the health-care technology company extended its deadline for bids to accommodate a late offer. Singer could be mulling a bid at a lower price, The New York Post reported Monday evening, citing sources. As a result of Singer's retreat, Athena has extended the final bid deadline by 10 days to next Thursday, the paper said. 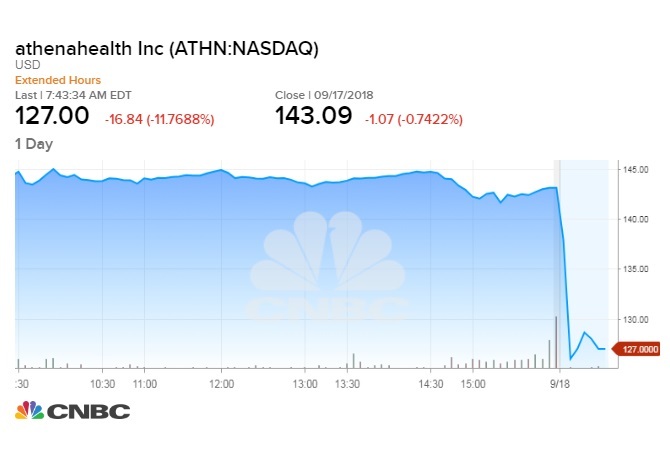 Athenahealth shares recovered some losses on Tuesday after CNBC reported the health-care technology company extended its deadline for bids to accommodate a late offer. On Monday evening, the New York Post reported that Paul Singer's activist firm, Elliott Management, had backed away from its $160-a-share bid for Athena. Singer could be mulling a bid at a lower price, the Post said, citing sources. As a result of Singer's retreat, Athena has extended the final bid deadline by 10 days to next Thursday, the paper said. However, sources told CNBC's David Faber that the delay was not a result of Singer backing out but a step made to accommodate a new potential strategic bidder. "I'm kind of hearing a bit of a different story there," Faber said on CNBC. "I'm hearing a late strategic was added and they did sort of push back the date to the 27th." Shares of Athenahealth, which sells a software platform to medical providers, had fallen 11 percent in premarket trading on the Post report. However, the stock regained ground after Faber's report. Recently, the shares were down less than 5 percent at midmorning. The stock is more than 7 percent higher so far this year. Elliott Management officials weren't immediately available to comment. An Athena spokesperson said the company had no comment. In May, Elliott Management said it was willing to pay a total of $6.9 billion contingent on due diligence. At the time, Elliott said its stake in the company was at 8.9 percent. Athenahealth in June said it sought strategic alternatives after its founder and CEO, Jonathan Bush, stepped down, facing allegations that he attacked his then wife 13 years ago. When initially announcing the review, Athenahealth said it would consider a sale, merger or remaining an independent company. Bush, nephew of former President George H.W. Bush, founded the health-care technology company in 1997.